at first I was disappointed that the nabaztag was more a recipient of messages (showed through light, sounds and ear movements) but it seems that it can perceive certain inputs (like if you move its ear, it can send a message to the server). to me, there should be more emphasis on the openness of the device (more than the API) and I miss a social software dimension on the Nabaztag website. Chris has already used Ning to create a Nabaztag social platform. Why do I blog this? The object is interesting to me because it's not smart, it's a wireless-linked device that allows basic communication and interaction through light, sounds and ear movements. Currently, this guy can only interact with: my computer (through the company's server) and cell phones. That's a cool feature: you can send SMS to your and your friends' rabbits.What is good is that it's a first step in the world of communicating artifacts. I feel like being more interested by this sort of device than by the locomotion of an AIBO (even though I am very curious of the AIBO communication and interaction practices, especially the blog thing). Ok, now let's take some time to understand the API. 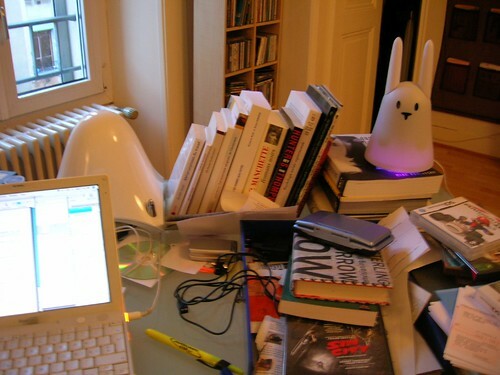 As a user experience researcher, I am very intrigued by possible user interactions with nabaztag; currently there are more outputs than inputs but using the ear could be a good way to interact with it (and consequently with other rabbits). Of course I would have be happy of having proximity-detections of objects and people in the vicinity but I guess it's a matter of time (next version of the rabbit).